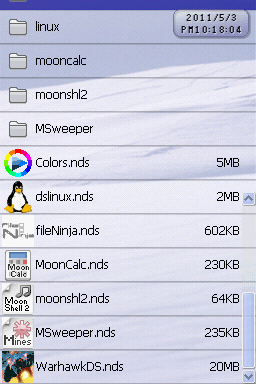 Moonshell is the most famous video and media player for the Nintendo DS. 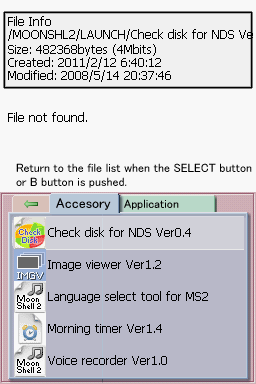 You can use it on any of the current NDS flashcarts such as the EZ-Flash Vi , R4, Acekard 2i, Supercard DSTWO and all others. This is the lastest version available called "Child Zwai Edition". Priority to process sound is higher so this is heavier than stable. Playing music which needs much CPU power like M4A with high bitrate/WMA/MDX/SPC might be skipped. This happen frequently if you play text or image simultaneously. You can feel improved sound quality only when you use DSi(LL) or ROMEO2 slot2 sound board. Sound quality on DS(lite) improved little even though processing became slow. If you press A longer, you can select playback mode and playlist editor which is valid in the same folder. Fixed a bug that auto DLDI patching wasn`t applied when you launch big homebrew. You can control music playback in screen saver. Listen to sounds like "PiPi". Modified behavior of play icon. 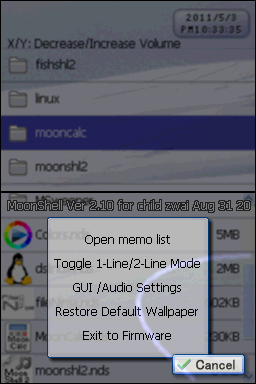 If you exits the folder which has music file currently played, moonshell shows note icon on the folder. Added ScreenSaver_ShowClock/ScreenSaver_ShowMusicInfo to moonshl2.ini [FileList] section to switch whether to show screensaver clock and music info. Fixed a bug that SJIS text couldn`t open in textreader if the memory wasn`t enough. Fixed a bug that jacket image wasn`t shown when you back to filelist from music player. If you put cursor on BMP file, moonshell shows simple preview. In prompt to input new filename, you can erase all by pressing B but also cancel by pressing START/SELECT. DPGEnc parameter was modified for recent CPU. You can encode 2-5x faster. Added "create new file" to SELECT submenu. Now text editor saves clipboard. You can paste to another file. Arrangement of buttons in Kana mode is reversed in left/right. A bug that moonshell sometimes stops in playing DPG isn`t fixed this time. Message file update of notepad and submenu isn`t done yet.